Dave was born in Michigan in 1958. The child of a military family, he lived in various places, including the Azores and Washington DC. After only two years of college, Dorman enrolled in the Joe Kubert School of Comic Art. After one year and the realization that he would not learn the painting techniques in which he was interested, he quit the school. With the loving support of his parents, Dave spent the next few years teaching himself his, now well-known, oil-painting style. He has done artwork for comic, book, and game publishers, including The Batman for DC Comics and the Indiana Jones and Star Wars series' for Dark Horse Comics. In addition he has done a wide range of book and magazine covers. Some of these include the Aliens paperback series, the Lone Wolf series, the Surfing Samurai Robots series and many other single book covers. His work is also showcased in the Bram Stoker nominated, illustrated novel Dead Heat from MoJo Press, and a book collection of his art, Star Wars: The Art of Dave Dorman. Recent trading card art includes the Star Wars Galaxy sets, Universal Monsters' Incredible Shrinking Man subset, a Robin subset in the Batman: Saga of the Dark Knight trading card series, a complete set of 98 painted trading cards for the Skybox Masterseries: Malibu Ultraverse, nine cards in the Skybox/DC Masterseries, a 25 card subset in the Skybox Masterseries: Creators Edition and artwork for the accompanying CD-ROM game, and a card set of his art called The Best of Dave Dorman: Chromium. Aliens: Tribes, an award-winning illustrated novel featuring 24 of his full paintings is available in hardcover and has been released as a trade paperback. Dorman's work is also now available as a series of popular, limited edition, Star Wars lithographs from Rolling Thunder Graphics. 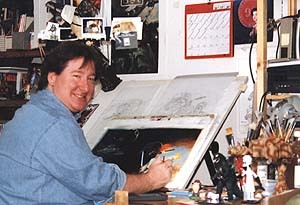 His many continuing projects include the ongoing Young Jedi Knights and Han Solo series' of paperbacks, and toy design for the Aliens 4: Resurrection movie.